You may have heard recently about the increasing importance of mobile tech strategies for small businesses. Tremendous opportunities are indeed available, but knowing how to take advantage of them is another matter entirely. Indeed, few small business owners are familiar with mobile app development, deployment, and management, or the benefits thereof. You have enough to worry about without becoming an IT specialist as well, right? No worries – we have some easily digestible information that we think you will find extremely helpful! For starters, to learn more about why you can’t afford to ignore mobile. If you’re already on the mobile bandwagon, however, and you’d like to learn a few key mobile strategies, please read on. 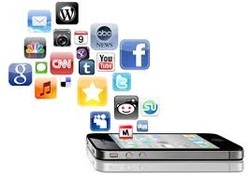 Mobile apps don’t live in a separate world, isolated from reality. They’re closely interwoven into people’s daily lives, at this point. When sitting at your desk, a calendar app will ring out a reminder from your pocket about your next meeting. You might then pull out your phone and order up car service on the way down stairs. When you hop in the car, a GPS app will tell the driver how to get to the destination. When designing a mobile app for your business, think about functions that your business already does, and brainstorm ways for apps to improve them. If you’re a dry cleaner, your app could notify customers when an order is ready for pickup. If you’re a real estate broker, your app could work with existing software to tell clients more about houses they’re visiting by accessing their device’s location data. And so on. The solutions are truly endless. Be creative, and use your app to enhance your business’s existing functions, and it will provide value right out of the gate. People don’t typically download small business mobile apps to screw around – they’ve got awesome games for that. They generally have a specific task in mind if they’re going to fire up a small business’s mobile app. Play to these tasks, whether it’s looking up contact or location info, making a purchase, submitting a request for a quote, or something else. The key is knowing what customers and prospects want to do with an app from your company, and then to build around that so that core tasks can be executed quickly and smoothly. It may sound like a pain, but after you roll out your app, it’s important to review user data and feedback, and to continually tweak your app to improve it. Not only will the user experience get better, but you’ll also gain familiarity with data that can provide striking insights into what your users and customers want. Apps are an excellent source of information – don’t discard it! A mobile device should not be thought of as a portable desktop. It has special features and functions that should be used and taken advantage of, such as the accelerometer (which detects movements), the GPS function, and personalized user data, if you have access to it. Look for ways to take advantage of these functions, and always remember that you can ping a mobile user no matter where they are. Many businesses now will alert customers to a special offer when they walk past the location, for example. They didn’t develop all those bells and whistles for nothing – use ‘em!